Whether you use your longboard as transportation or pleasure riding, night-time sessions can be harrowing if you’re screaming through poorly-lit places. The Beamboarder is a solution that is simple to build and easy to throw in a backpack whenever that giant ball of fire is above the horizon. Boiled down it’s a high-power LED and a Lithium battery. How’s that for a hack? Actually it’s the “garbage” feel of it ([Lyon’s] words, not ours) that makes us smile. An old hard drive with as high of a capacity as possible was raided for parts. That sounded like a joke at first but the point is that early, large drives have bigger magnets inside. You need a really strong one because that’s all that will hold the LED to the front truck of our board. From there it’s a matter of attaching a CREE LED with thermal adhesive and wiring it up to the Lithium pack that has been covered in shrink tube to keep the elements out. The headlight is under the board, which is courteous to oncoming traffic. Once you pull off this hack we’re sure you’ll want to go further so we suggest wheels with LED POV displays and there’s always the option of going full electric. 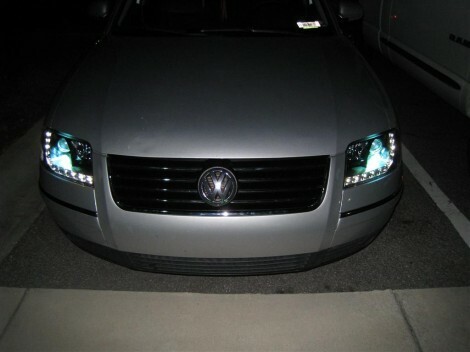 The headlight enclosures on [Bill Porter’s] 2004 Passat had yellowed with age and were not outputting the kind of light they should. He decided to replace them with some aftermarket modules that also incorporated LED strips. When they arrived he was surprised at how easy there were to drop into place. But when testing he was certainly not satisfied with how they worked. The day-driving mode used the HID bulbs at full power, where the factory assembly had dimmed them during the day. He set out to alter the electronics to work as he prefers. Always the mad scientist, [Bill] started off by making a truth table showing how the lights reacted to the various states of the ignition and headlight switches. What he came up with is an AND gate built from a relay and diode. 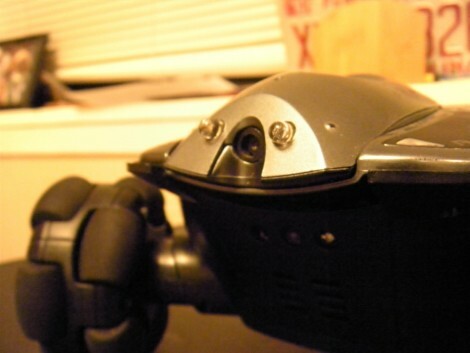 It allows him to have the LEDs on as the running lights (without the HIDs on at all), and leaves the rest of the functionality unaffected. Even the most thorough inspection may not raise the alarm that this Rovio has been hacked to include LED headlights. [Adam Outler’s] super clean work puts the two light sources on either side of the camera for maximum effect. It may not provide as many Lumens as our external headlight hack, but we were never all that excited about the black project box that housed it. [Adam] built the circuit on a scrap of perfboard, using a transistor to connect the LED pair to the battery, with the original LED power wire going to the base in order to switch the transistor.